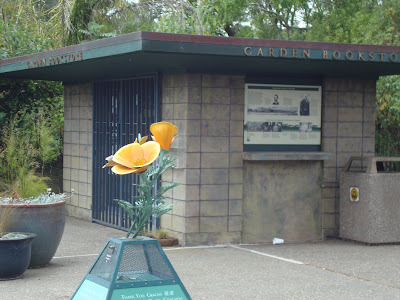 The San Francisco Botanical Garden is located in Golden Gate Park. One of the best things about it is the cost of admission…nothing! 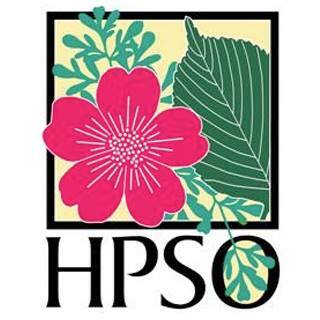 The gardens are free. If you have more patience than we did you might even score a free parking space on the street. Makes for a very affordable outing, yes? The negative? It’s free. So perhaps it suffers a bit from lack of funding for upkeep and care. Things were less than crisp and the overall design seemed a little incoherent, trails rambled and I was never sure where I was going and what I missed. If I hadn’t printed a map of the gardens I never would have found the Succulents area (which was only the MOST IMPORTANT PART!) 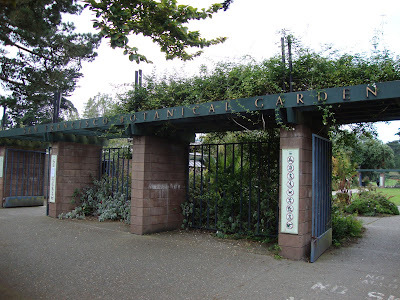 as it was hidden between the Children’s Garden and the Redwood Trail. You are greeted by a row of signs. These were my favorite. 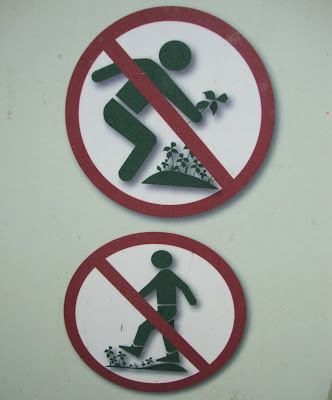 No tromping on the flowers and no picking the flowers. Darn. We were there on Columbus Day, which evidently is a major holiday as the tiny bookstore was closed. Too bad. 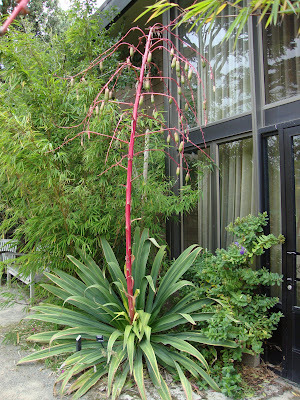 Tall Aeonium Schwarzkopf by the front entrance. 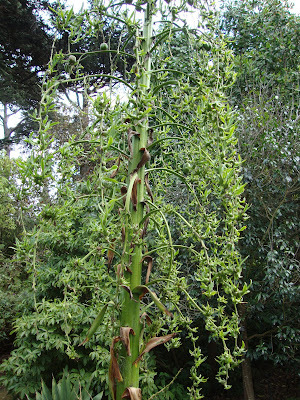 Beschorneria Albiflora from Mexico. Very exciting to see as I have one of these that I purchased last spring. I had no idea what it could become! 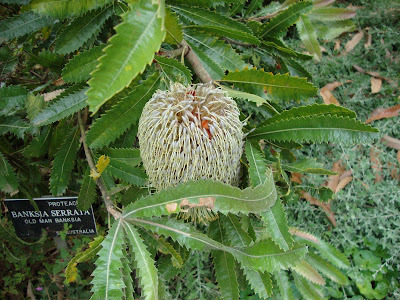 Banksia Serrata…very cool as is, imagine it in full bright bloom! There were so many enormous Echium. 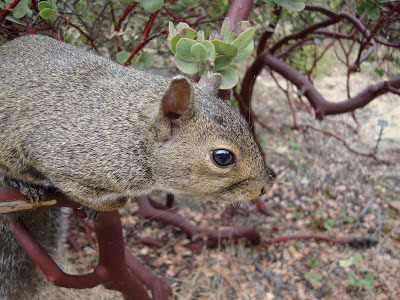 I was drooling and determined to overwinter mine. They were huge! 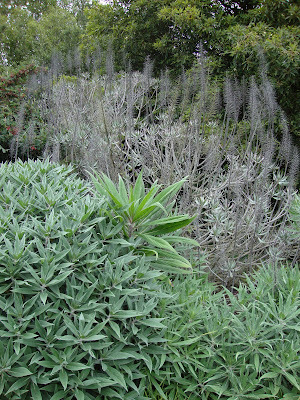 Look at those Echium bloom skeletons (the grey spikes)! They must have been amazing. 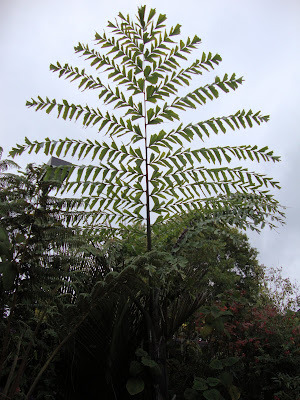 Fish tail palm…huge and remarkable. Little plantlets on a fading bloom soike of Furcraea Roezlii. Cool! Protea flower. 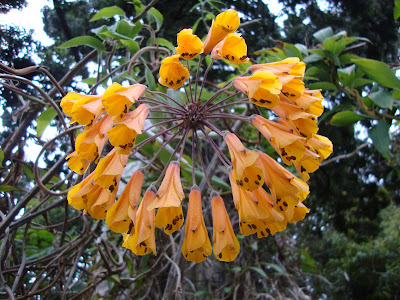 Amazing to see in “real life” growing on a plant, as I normally buy these as cut flowers. 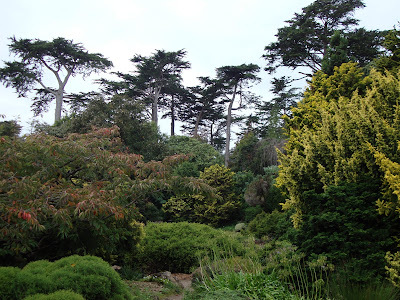 Monterey Cypress. I am in love. 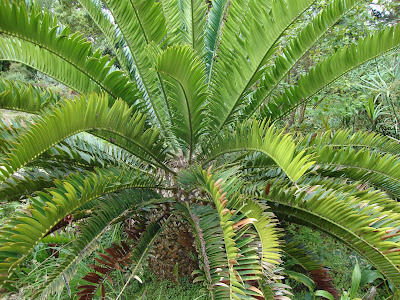 One of many large Cycads. 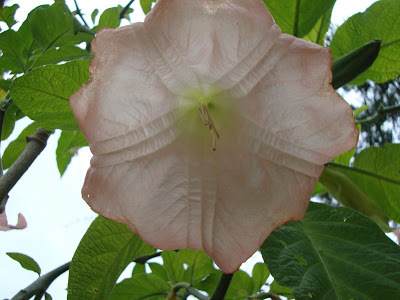 Datura… Squirrels. OMG…they are everywhere! I swear they were following us and Looking at waiting for the right moment to pounce and, well, it wouldn’t be pretty. 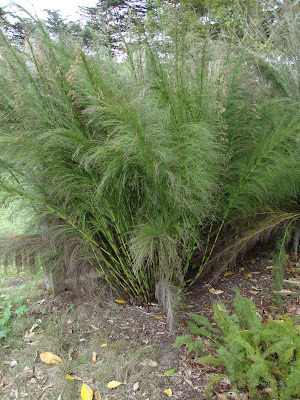 Restio Rhodocoma capensis mikado stems, amazing! 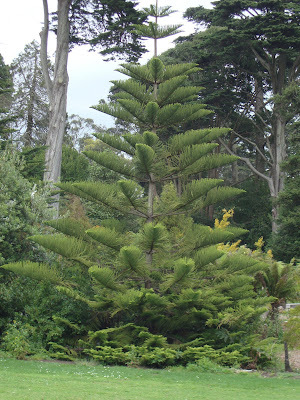 Araucaria Heterophylla also known as Norfolk Island Pine, isn’t it beautiful? The perfect Christmas Tree. 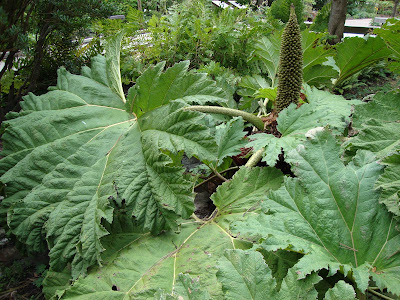 Chilean Rhubarb Gunnera tinctoria, described as a primitive looking Chilean plant with rough textured leaves that can grow to five feet in diameter…yep! 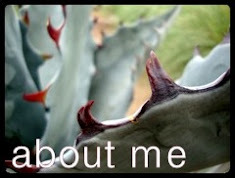 Tomorrow the succulent garden and the aloes… (the best part!). And don't worry, it's shorter than Part 1. Awesome thanks for sharing. I wonder if I can get there from BART might be a fun day trip. 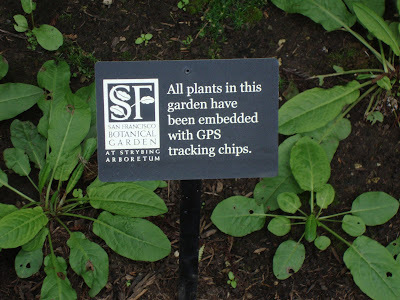 Oh, I most loved the sign about the GPS tracking chips being embedded into the plants.... sad that they would have to go to this extreme, but funny nonetheless! 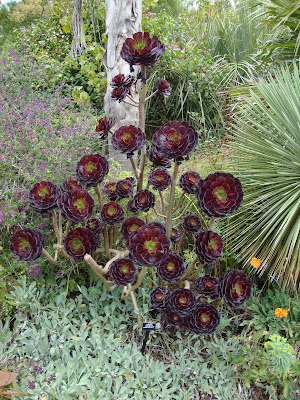 Some of those plants are truly spectacular. Love the sign about the GPS tracking chips-wonder if its actually true! 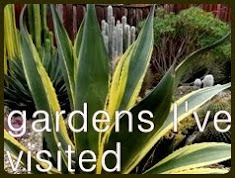 I actually did not get to the succulent garden on my visit so look forward to your photos. I am so oblivious, I've never even noticed the entry signs, they're arty too . Duh to me. But the embedded GPS tracking chip sign is a hoot. Never noticed that one either. 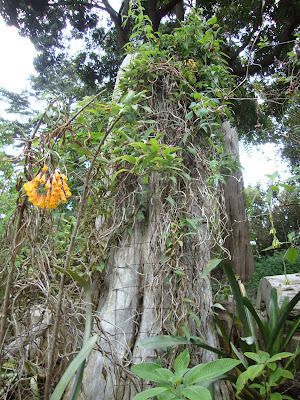 Your unidentified climbing vine is Bomarea caldasii. 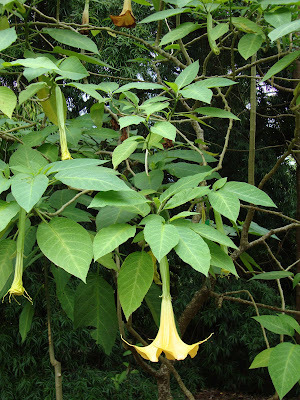 That's a plant that I have tried twice before and killed. 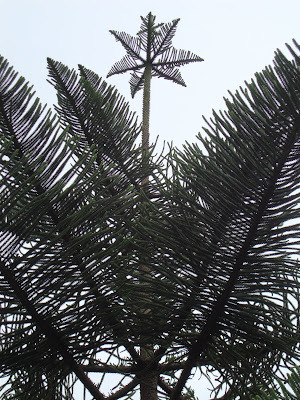 Love the photo of the Araucaria, from the angle that you captured, it looks like there is a star sitting on the tip of the tree. Walked those paths many times and always enjoyed my visits, but it was mostly before I started really paying attention to the plants, so I kind of didn't care about the loose organization. I did like the New Zealand area, so many funky interesting choices there. 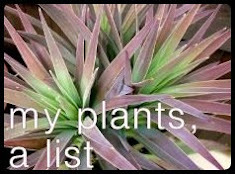 Never realized there was a succulents collection, so am curious to see what you found! Looking forward to Part II and hope you make it as long as you like! I thought the tracking chips sign must be a joke, except that I remember reading about how rare and expensive plants get stolen sometimes. 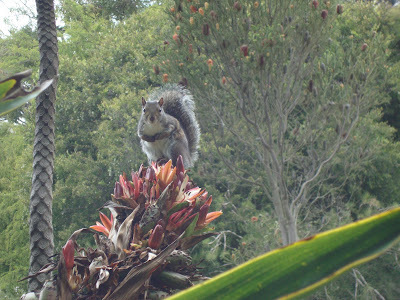 So maybe they really do have chips in their grand old tree ferns? Hi Loree~~ I want a sign like this in my garden. Do you think they'd mind if I swiped it? 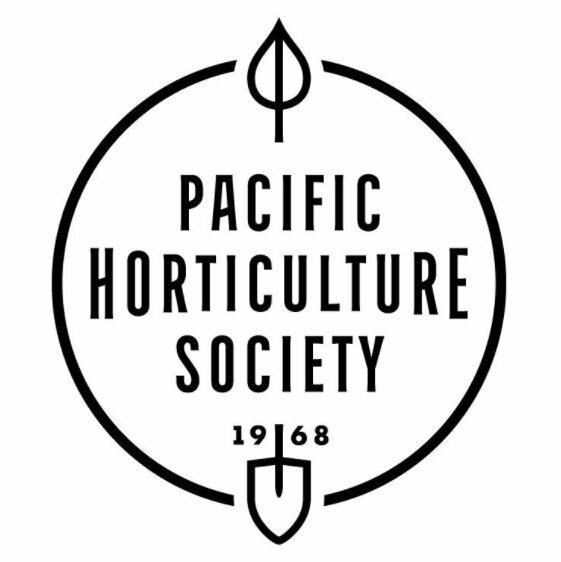 I promise to leave the plants alone. Maybe. I haven't seen Part Two yet. 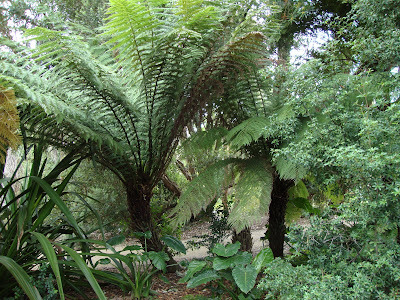 Actually that tree fern is to die for. I love your shot of the Christmas Norfolk Pine. The Restio...one word: LUST. 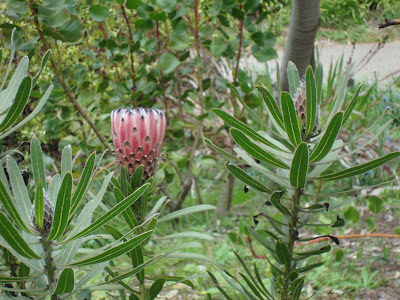 And of course, the PINK protea blossom. 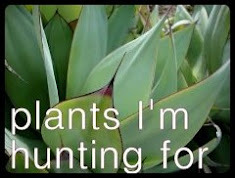 Cool plants, and what a hilarious "GPS tracking" sign. The one and only time I was in SF (14 yrs ago) was over Columbus Day, and it WAS a big deal. There was a parade, a street festival, etc. Kind of took us by surprise actually. I wondered what you'd think of it, I loved the agaves and tree ferns and restios, but you're right, less than crisp is a good way to describe it. 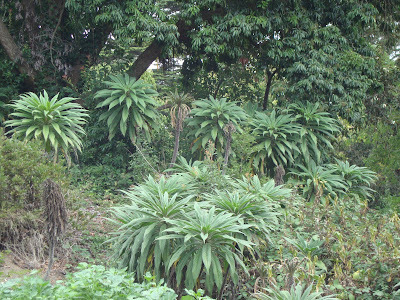 I remember noticing those Echiums, I didn't know what they were at the time but I liked them. I didn't make the connection with the one you have and what I'd seen there until you mentioned it. 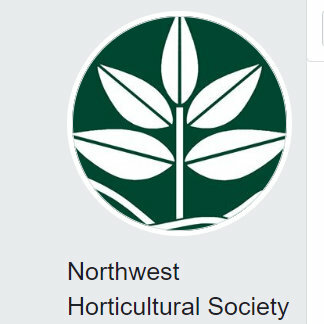 You're right about the map issue - I totally missed the succulent garden!! And Mom Taxie Julie can definitely get there on the BART, I did it. Then I walked around the neighborhood and ended up catching a bus back to the city. If I remember right, the bus ended up being a more scenic route. MTJulie, yep - see Megan's comment! Tezza, agreed. It seemed like a challenge to me. Can you just see the guys in some dark room with a computer screen in front of them? 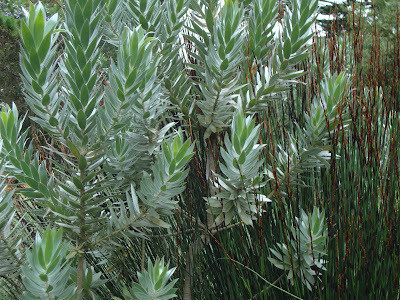 "Hey Joe, looks like we've got a problem...the Leucadendron argenteum is on the move, currently at 12th and Lincoln better send out the armed guards...."
Nicole, seems like you are in SF a lot? I am jealous! DD, funny...that's the way though isn't it? If you are a regular and you know where you are going then the mystery is gone! 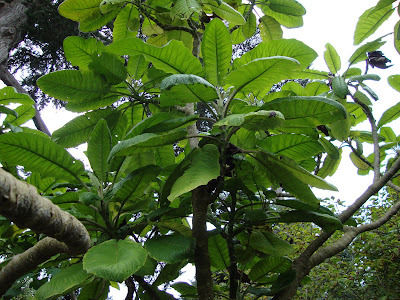 Thanks for the ID and perhaps the 3rd time is the charm for you and the Bomarea caldasii? Karen, what you said is so true! 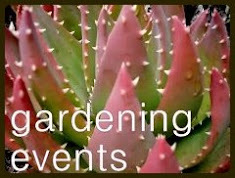 If you aren't "into plants" you don't see things that you will later, when you are. 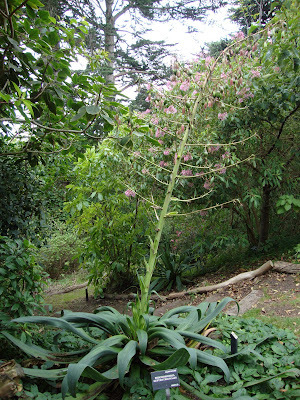 I really don't remember seeing so many agaves in SF when I have been there before (multiple times), but that was before I got the "bug." VW, I've even heard of many Japanese Maples being pulled out of the ground in people's yards here in Portland. The bad guys are everywhere. Grace, oh I think you could get a sign made with even more threatening language! Fun! I'll help. That Restio was so HOT! Pam, I think I am glad I missed the parade. I am so NOT a parade person. But I do have to admit ya gotta love a city that finds any excuse to party! 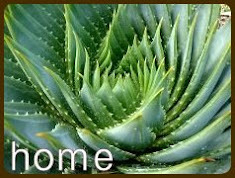 Where can I buy a protea plant that would survive in a zone 9 climate?